Build A Bigger List & Make More Profit With Your Own High Converting Squeeze Pages The Easy Way! Are You Struggling To Build A List? * Have you got a squeeze page and trying to build a list but conversions stink? * You havent got a squeeze and arent building a list yet but want to start asap!? * You have a squeeze page but want more traffic and subscribers? If you are not building a list already, you are missing out on a lot of easy money. If you are already building one, then I bet youd love to get more traffic to your squeeze page! Because you know that more traffic means more subscribers...and more subscribers means more money in your pocket! 2. You need to drive traffic to your squeeze page so they can jump on your list! These two ingredients go hand in hand. When one of them is down, your whole list building business will suffer. But now you dont have to suffer any more. You can have your own high converting squeeze page up online and get loads of traffic to it because Im going to show you how in my new ebook. How To Create Hot Subscriber Sucking Squeeze Pages And How To Get Traffic To Them! Even if youve never put a squeeze page together before or are struggling with your current squeeze page, dont worry because this little guide will show you all you need to know to make a killer squeeze page and get traffic to it! A few other simple strategies that will pour on the traffic in 5 minute or less a day! Plus many more secrets inside the report! Finally Stop Suffering From A Tiny Or No List Again! This is a unique chance to finally get more subscribers or start building a list for yourself! With the helpful no-fluff info inside this concise ebook, youll have all the knowledge and steps you need to start building a profitable list building business from scratch right before you in the one spot! You might be thinking an ebook of this high quality must be expensive. But I think youll be shocked when you see the insanely affordable price. You can pick up a copy of List Exploding Squeeze Page Secrets today for a tiny investment of $17! Thats just a drop in the ocean when you consider how much money youll save on copywriting and technical services, because Ill be teaching you how to do it all yourself inside this guide. But whats more is that youll learn the life long skill of list building which will be worth thousands - and perhaps even millions of dollars to you over your online career! So start now and discover the secrets to list exploding squeeze pages today for a tiny $4.97 investment! 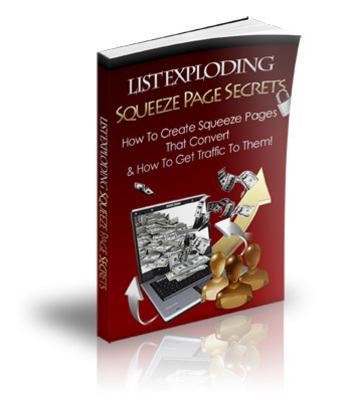 List Exploding Squeeze Page Secrets - Plr!